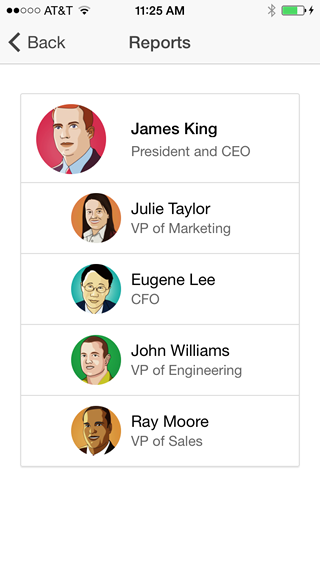 It has been six months since I posted the first version of the Employee Directory app built with Ionic and AngularJS. Ionic has been moving fast, and it was time for an update. Employee directory is a sample application that allows you to look up employees by name, view the details of an employee, call, text, or email an employee, and navigate up and down the org chart. This new version of the application uses REST services powered by a Node.js server instead of in-memory data. You can also run the application as a hybrid app in Cordova. Check out the Github Repository for detailed instructions. 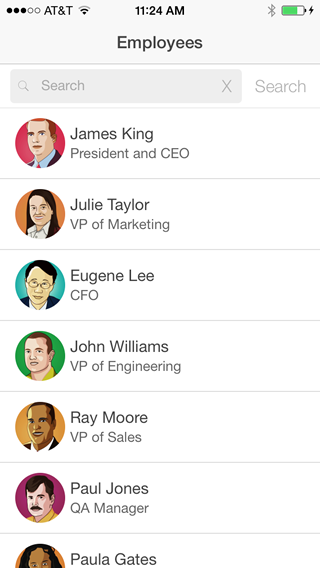 This is great, but there is always one thing bothering me with these mobile apps: how to retain the scroll position when navigating back from the employee detail view to the list of employees….there is something like silentScroll in jQuery Mobile, which is less than ideal…anything better here with Ionic? The scroll position will be saved when you go back in the history. Although in some cases, for example if your list takes some time to be fetched each time you go back, you will have to do some work to get the position to be ‘loaded’ again when your list is done refreshing. What’s your use case? Back in the history does it mean with the DOM cached? In my case I cannot cache the DOM so I refetch the entire list and then I scroll to the position…which is pretty much what you are suggesting, no? The only problem I have is the list item I tapped will be placed at the top of the screen as I have not figured out yet how to calculate the right offset from the top of the screen. In Ionic, the scroll position will be saved when you go back in the history. Although in some cases, for example if your list takes some time to be fetched each time you go back, you will have to do some work to get the position to be ‘loaded’ again when your list is done refreshing. What’s your use case? Hi Christophe, thanks for your updated Ionic version! First off this is awesome thanks! Based on the way this project is currently setup, how would I go about adding a button to the header bar in the “employee-list” template? I only want this button to show up on the home screen and it would bring up a modal. I can’t seem to figure out since the ion-nav-bar is sitting at the “root” of the application. This isn’t bad, a little bit clunky and it’s still got nothing on Native. You should check out Xamarin you’ll be able to develop much much better apps than this. So my question – where can I find a rockstar phonegap dev who’ll replace him? The app is based off my website (currently spaghetti php/mysql) which has been/is pitched as a television show spinoff often, tons of press, user generated, and fairly unique in its space. I tend to worry about freelancers…any ideas? I am a bit fan of ODesk.com. Might want to look for freelancers there. Lots of ways to filter the consultant search so you get just what you’re looking for. Be sure you talk to them over Skype and get code samples as well, that’ll give you a better idea of their coding style. The Employee Directory available for download from the Apple App Store is not compatible with IOS 8.x Do you intend to update it to be compatible with the latest IOS 8 release? Are these and your other samples available with open source licensing? Loved example, inspired me a lot and helped me on a personal project. However I can not use my Rest server. I do not know what my mistake but the application only works when I submit to your page (‘http://ionic-directory.herokuapp.com/employees/:employeeId/:data’); in services.js file. Hello. I am trying to find an Employee Directory for use within our city. I really like the speed and look of your sample application. 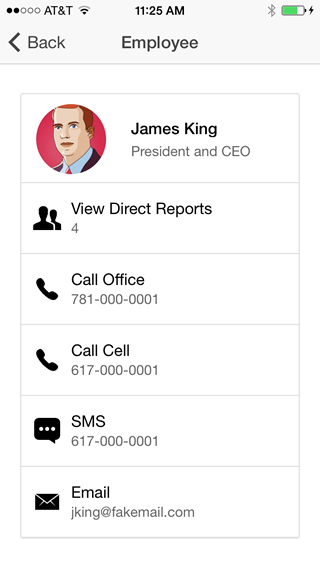 Is there something like this that has some type of administration side where contacts can be edited, deleted, added, etc? Hello, i like a lot your app. I run it in node server in local enviroment and works nice. When i build the app in the Phonegap website, It looks like its done without errors, but when I open de app in my android mobile, it doesn’t show the employees which i assume it is because the node won’t started. So how could i fix this to see the app running as in browser ? Thanks Christophe, but isn’t it a bit of a half & half app? Some of the data is stored on the Node server side ( see: routes/employee.js ) but the pics are at the client side ( see: www/pics , pulled by www/templates/employee-detail.html and the statement ) which makes no sense. I wish this would change to having a database on the server, storing all information there, and pulling out the data from the client via an API. Maybe a 3rd update of the article? Really interesting and informative article and it is useful information. Thanks for sharing the great article with us. I just wanted to say thanks.I enjoyed nice & excellent blog post. Thanks for sharing this great article. I read your post and me really like it. I also like composing something if my downtime. So I could find out something from your write-up. Thanks.